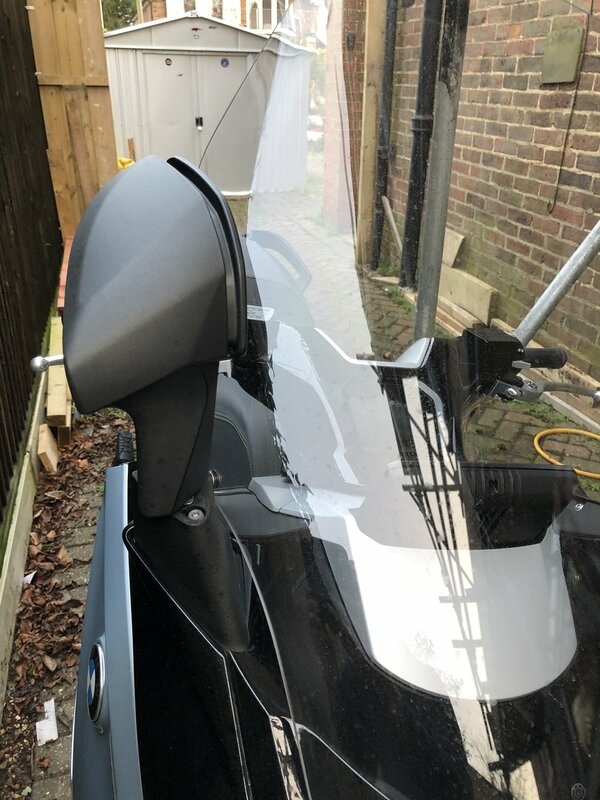 Jeremy Webb reviews the electrifying BMW C-Evolution scooter, taking on a trip to the south coast. The BMW Cevolution is a revolution. Fighter jet looks, display and performance from an electric scooter. launch like an F18 off a carrier. Super bike 0-60 time, matched with super nimble agility. It changes direction as soon as you think about it. I picked the C-evolution up from Vines BMW in Guildford on an awful day, weather wise. 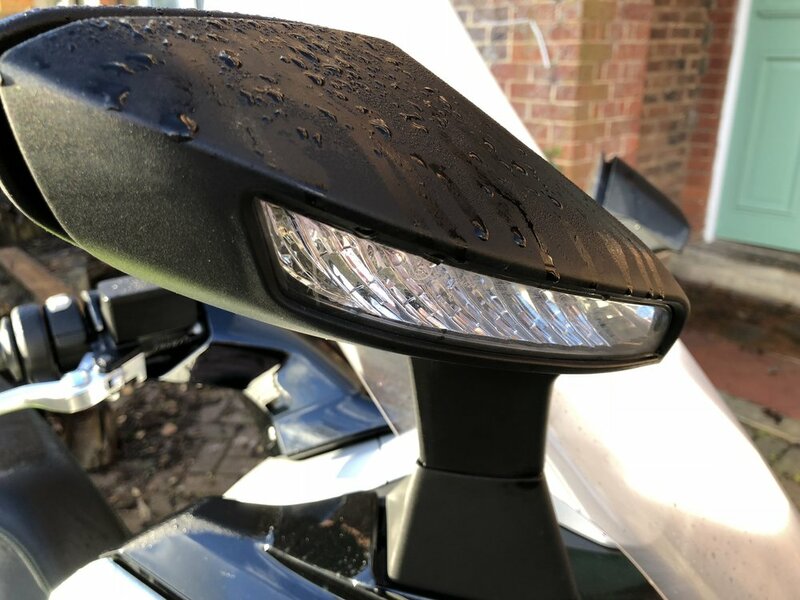 A blowing gale and heavy rain dogged me the entire journey down the A3 to Portsmouth, but I hardly got wet being protected by the great fairing, which also saved me being battered by the wind. Electric scooters and (motor)bikes are targeted at urban use, where users ride a fairly short distance on a commute in to or around a town or city. 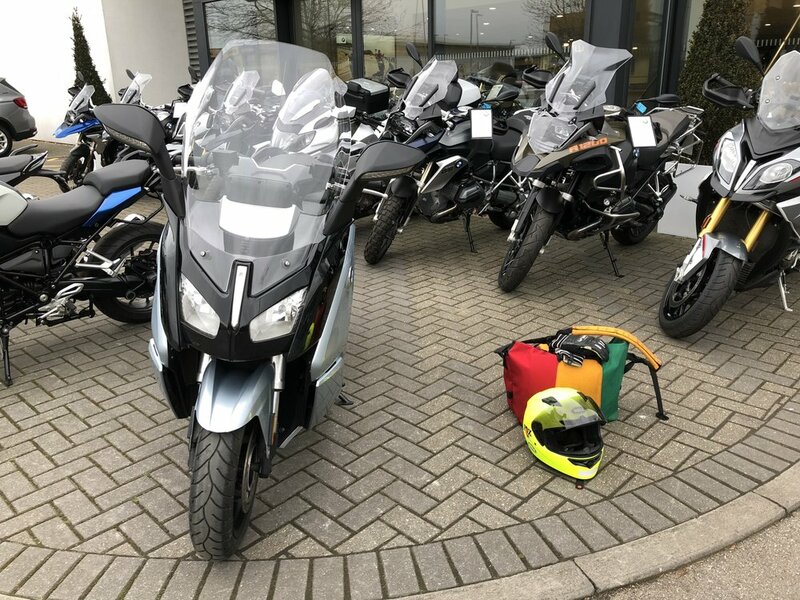 They have a range of about 100 miles maximum on a full charge which will generally mean owners only need to charge the bike every other day. The BMW Cevolution follows this pattern with 100 miles on a full charge, when riding in economy. I found though that this as with miles per gallon values on normal bikes, really depends on how you ride. I was heading home, some 56 miles from Vines in Guildford, so I set off with nearly a full charge and 93 miles range showing on the easy to read, well designed display. you zoom forward like a greyhound out of the traps. This is even in Eco mode. 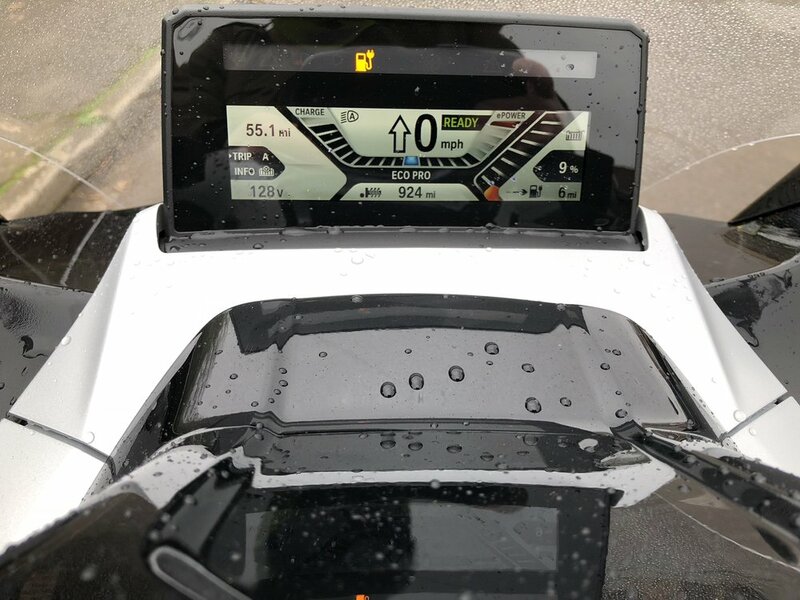 The weather made for a very testing journey for any machine, but the Cevolution performed superbly. A real credit to the design. The large seat was very comfortable and the heated seats helped a great deal. A huge bonus on a daily commuter. The scotter took the A3 in it's stride and I held my own with speed. No having to sit in the inside lane for this machine. The top speed is 86mph but I cruised along at 68mph happily. I arrived home just in time, regarding range. 6 miles left according to the display. The easy to read, clear display shows charge remaining, estimated mileage remaining before charge, and speed. 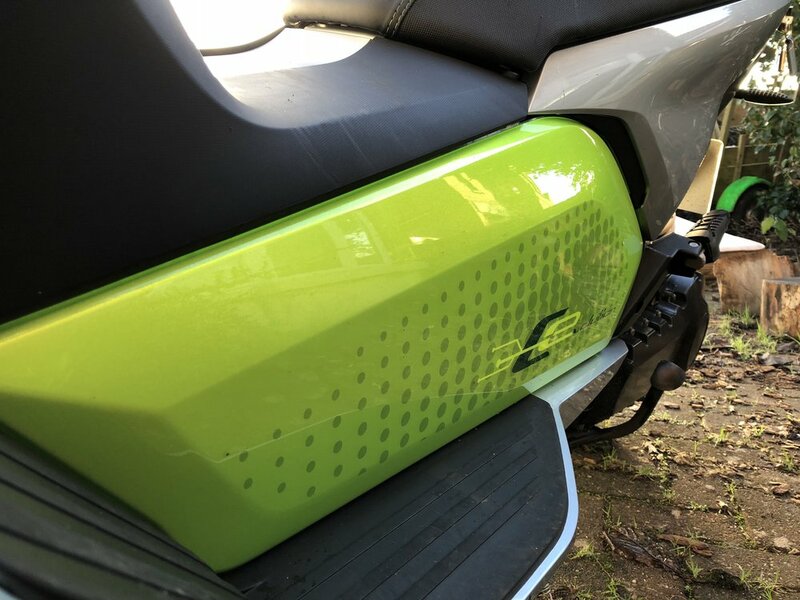 It also shows charge going back in to the scooter, through regenerative technology. Applying the brakes not only stops you, and stops you well on this as it has full ABS, it puts electricity back in to the battery thus charging it. This then extends the range, so when commuting in and around town where braking happens more often, your range will improve quite considerably. Ideal for commuting for a few days at a time before having to plug the scooter in. Charging.... this is the main concern for people thinking of purchasing any electric vehicle. If you have a house with a drive, there are no issues. Park the scooter near the house and run the cable in to the house, from the scooter. The adaptor end is in the scooter, then Plug in the three pin plug and you are charging. Simple. just like plugging in a kettle. Above is the charging unit showing you charge rate. One lead goes in to the bike, the other lead has the three pin plug to go in to any domestic socket. 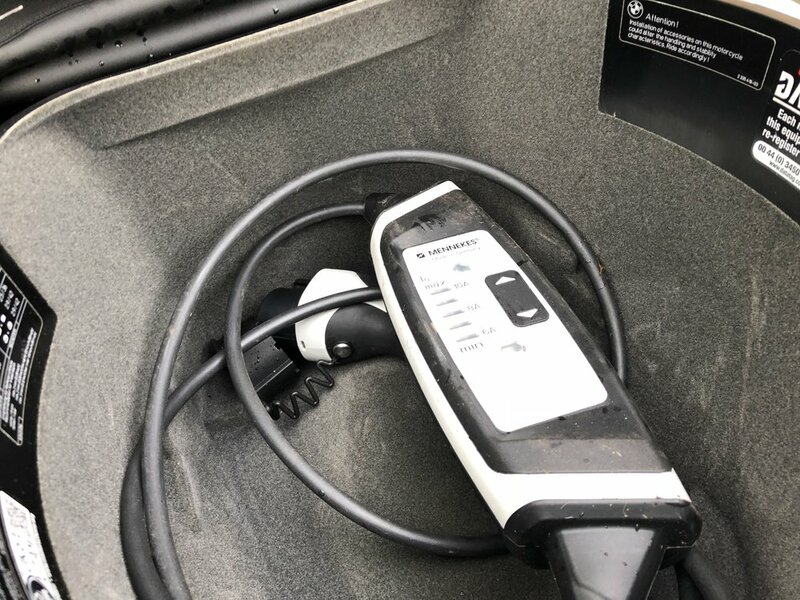 If you don’t have a house or driveway then charging can be an issue. 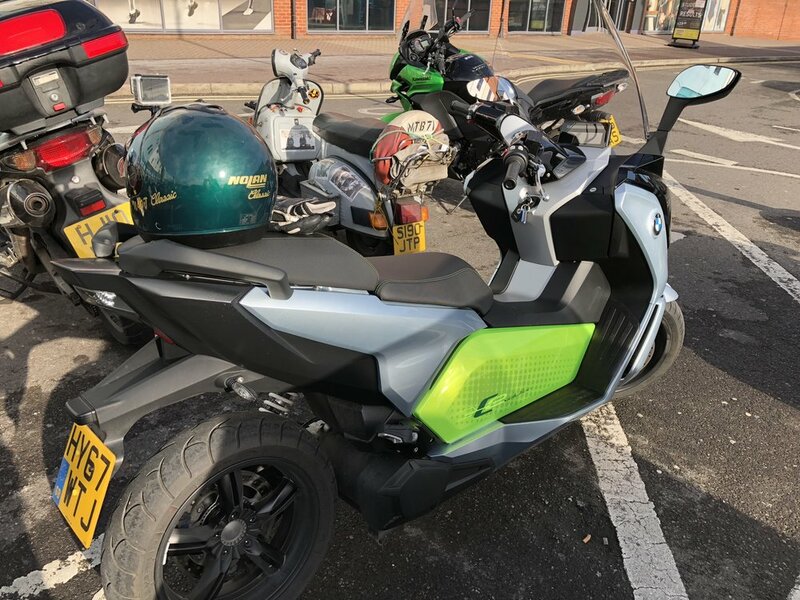 You can charge the scooter at some fuel stations, supermarkets and other locations such as leisure centres and hotels. I see the other big area that could help with charging, being workplaces. If they have sufficient space around the building outside, they could install free charging stations. Being that you do only need to find a normal household electric socket there should be somewhere you can find to charge your steed. I even managed to get the Cevolution in my front door, and put it on charge to test wether it would fit. The range plays a major factor in the charging issue too. This scooter has approx 100 mile range when fully charged and ridden on eco mode. The most economical setting. The scooter is still super fast pulling away but not so much power to the rear wheel, and top speed is reduced. If you can get 100 miles before charging this allows a good amount of riding, for commuting or riding around town. Probably three days riding between charging, and as mentioned if you can charge at work then happy days. No range anxiety. As mentioned Range is actually helped while riding as the BMW uses regenerative technology, through braking. When you apply the brakes it puts charge back in to the battery, thus restoring some mileage. This is ideal in towns and cities, where you are braking much more often. The bike has great looks, and is very streamlined. The large fairing works well keeping you from wind buffering and some rain protection. The narrow footprint of the machine along with folding mirrors allows you to put it in tight gaps when parking. I squeezed it through scaffolding to get in my garage and also got it in the front door of my house, to prove it could be charged inside. It is also great at filtering through traffic which most owners will have to contend with. Handling in all situations is sharp and spot on. Centre of gravity is good so you can flick the scooter around as you like. You can also choose to ride in normal legs astride position or relaxed with feet up, chopper style. Sadly I only had the Cevolution for three short days but in that time it captivated me. I was going out on it just for fun, something that reminded me of riding my first Yamaha DT100. Well summing, up. You have probably guessed that I loved this machine. There is nothing I dislike about it for what it is intended for, and that is how you have to base it on. You are not likely to buy it for a holiday trip to South of France or for riding to Moto GP events but those that want a daily commuter could choose nothing better. Seriously. £12k seems a steal for what you get. Agile, well built, gives good range, comfy and boy ooo boy fast. Being a BMW you know it is well made and reliable. If pizza delivery guys had these, then there would be no late payments. Then again they may be having too much fun drag racing hot hatches. 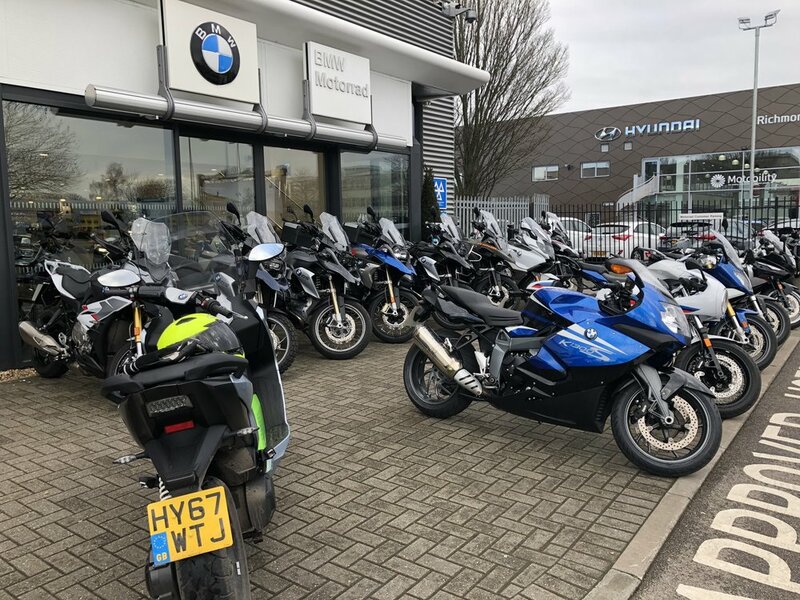 Thanks to Lee Sarjeant and his team at Vines BMWBikes Guildford. The future is looking bright for Aston Martin thanks to the DB11.